WASHINGTON — An amazing line-up of Members of Congress, union activists, environmental leaders, people of faith, small business and community leaders stood together on Capitol Hill today to show the broad and growing opposition to Fast Track authority for trade deals like the Trans-Pacific Partnership (TPP). NETWORK’s executive director Sister Simone Campbell, popularly known as the leader of “Nuns On The Bus,” said the effects of our past trade deals have been coming home to roost. She pointed out that children from Central America swarmed the U.S. borders last year directly because the Central American Free Trade Agreement disrupted the economies in rural areas of those countries. “I’m here today to oppose fast track because we know from Catholic sisters in Central America, my sisters in Mexico, that these trade agreements create a huge imbalance and disequilibrium, especially in rural communities,” she said. 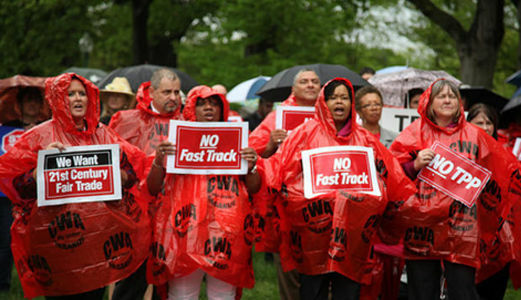 CWA is part of a 100-group coalition that is fighting back against Fast Track, and the next 100 days are critical. Fast Track authorizing legislation is expected to come before Congress in March. “We’re prepared in every district to work as a coalition, not as labor, or farmers, or consumers, or environmentalists, but together to talk about what the global economy should be and how it could work for all of us,” he said. “We are humble about what we face but we are tens of millions of Americans and we are committed that we are not going to have another raw deal on trade. 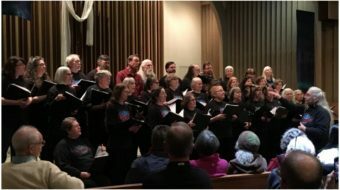 We’re going to come to the 21st Century and negotiate trade deals that work for tens and millions of Americans, not just for hundreds of corporations.” CWAers and activists from coalition members will participate in National Call-In week, beginning Jan. 26, to let members of Congress know that Fast Track must be stopped. Check out www.stopthetpp.org for more information. Reposted from Communication Workers of America website.